For further information on Operational delivery Networks please visit NHS Englands website about Operational Delivery Networks. Thank you to all the families who have kindly shared their baby’s journey through neonatal care with us. We hope you will find the stories inspirational and comforting, as they offer a unique and realistic insight into life on a neonatal unit from a parents’ prospective. On 5th August 2015, at 28 weeks pregnant, I very suddenly gave birth to our beautiful twins Evie (weighing 2lb 7oz) and Noah (weighing 2lb 14oz) at Tameside General Hospital. As they were nearly 12 weeks premature they required Neonatal Intensive Care Unit (NICU) treatment. Noah was unfortunately separated from his big sister Evie on his birthday as there wasn’t another intensive care incubator at Tameside General Hospital to support him. He was transferred to Royal Oldham Hospital NICU and his big sister Evie luckily followed him the day after. Once Evie and Noah were well enough to be in a level 2 neonatal unit we were moved to Calderdale, which was our local unit. Our 9 week NICU journey was a long, emotionally draining rollercoaster, but eventually we got to bring our miracle babies home. We found it so comforting to speak with other families who have gone through similar experiences, to share our concerns, our ups and our downs. Our little girl, Heidi, was born on Mothers’ Day 2015 at Tameside, after a very straight forward pregnancy and labour (even though I had to be induced as I went 11 days over). However, something went wrong during the hour after Heidi was born and she collapsed while she was skin to skin. Things happened in a blur, and it was like I was watching a film of someone else, but it was happening to us. Heidi had to be resuscitated, and was whisked up to NICU. We were left in shock – no idea what was going on and whether she was ok. I remember the consultant coming in to give us an update, telling us that Heidi had suffered a lack of oxygen to the brain (which we now know as hypoxic ischemic encephalopathy, HIE for short) and was being transferred to Oldham NICU for cooling treatment. We had a few minutes to see her before transport arrived. Leaving her was so difficult, and whilst part of me couldn’t get to Oldham quick enough, another part of me was terrified of what it would be like there and what would be waiting for us. The nurses at Oldham were amazing. They took such good care of Heidi, and of us; from making arrangement for us to stay in the parent room, to encouraging me to express so that Heidi could be fed my milk via a tube. They were with us every step of the way. We stayed there for a couple of weeks, before being transferred back to NICU at Tameside, and eventually the Children’s Unit before coming home, 8 weeks after she was born. The injury to Heidi’s brain was severe – she now has cerebral palsy, epilepsy, is fully tube fed, has a tracheostomy, and severe developmental delays. She is also pretty awesome! We never imagined that we would be on a journey like this, and we have found ourselves in a whole new world of “special needs”, but it’s not such a bad place. We have made new friends, learned so much, and above all, realized that there is always hope. I often think of parents who may just be starting out on their own journey, and how daunting it must seem. It’s true when they say that it’s like being on a rollercoaster – there are some big drops, but also so amazing highs. After we’d had a very quick first cuddle Florence was whisked off with the NICU team. She required some help including drugs for her lungs and antibiotics for an infection she had. She spent time on both CPAP and the ventilator. Flo spent 5 days in intensive care before she was moved into special care. In total we spent just 2 weeks on the neonatal unit before we were able to come home. Spending any amount of time in hospital is tough, but it was made even more challenging as we have a little boy (Benjamin who was 3 at the time) who couldn’t understand why his mummy was in hospital, why he was having lots of extra sleepovers at Nanny’s or Granny’s and then it was even more confusing when his little sister arrived and she couldn’t come home with him to his house. Benjamin would say every time he left the hospital ‘I’ll take strawberry home with me now’ (strawberry was the nickname Benjamin had given the baby while I was pregnant) and it was always very difficult to explain why he couldn’t! It really affects the whole family. NICU is a wonderful place the staff and support you receive is excellent not just from staff, but the parent support groups and the other parents you meet. They are going through the same as you and that can 100% appreciate how you feel! Tom was born at Royal Oldham hospital 24 weeks and 5 days, he weighed 1lb 7oz, he was taken straight to NICU. I was totally unprepared for the neonatal unit. I had never seen anything like it, so many machines and beeps and incubators it was terrifying but strangely calm. I was even less prepared for seeing Tom for the first time. Underneath all the tubes and wires was this tiny little baby, his skin was red and see-through, his eyes were still fused shut. It was a shock! Despite him being so early and small his first few days were pretty stable. The nursing staff taught me how to do cares, but I dreaded them asking me if I wanted to change his nappy because I didn’t. I was too scared to touch him. When he was a week old they discovered he had a shadow on his right lung. The doctors weren’t concerned straight away as Tom was stable and improving, but after a few days Tom started to go downhill and he had become distressed. The doctors realised that whatever the shadow on his lung was, it was causing major problems and from ultrasound scans it was clear it was getting bigger. After a week, Tom’s pressures on the vent were going up and so were his oxygen requirements. The shadow on his lung was a growth and was stopping his lung from working properly. Everyone was baffled by it and the decision was made to move him to St Mary’s. Tom was booked in for surgery to remove what was thought to be a CCAM on his lung, but this was cancelled as the day before the surgery it was noted that the shadow had started to disappear. Twelve days later we returned to Oldham. Tom began to have a fairly smooth ride at last, we had many setbacks and he gave me and the nurses’ lots of scares. The nurses and doctors became our family and the unit became our home. The days are long for parents on the unit and it can get very tough and isolating. I found peer support got me through the day and I made friends with lots of other parents. I was able to room in for several nights with Tom, to establish breastfeeding and learn to get to know him properly. This was so valuable for me and I felt well supported and ready to take him home. Tom came home after 127 days in neonatal care, he was on home oxygen but we were prepared for that and it didn’t faze us. Tom is 3 now and he is doing well, he is a little behind but he does things his way. He has a fantastic personality and is an absolute handful. I could never find the words to thank the people who were involved in Tom’s journey. We are eternally grateful that we were given the opportunity to watch our amazing little boy grow up. Without the wonderful neonatal teams he would not be here today. When Hollie­ was born it was clear she was very poorly, she was unable to breathe on her own and the medical team suspected Trisomy 21, more commonly known as Downs Syndrome. After a tough 48 hours and little or no improvement the doctors discovered Hollie had two holes in her heart, this is known as VSD. It was also confirmed that Hollie did have Downs Syndrome, which was a huge shock to us. Our stay on NICU was just under 5 weeks and it was a tough time for us as new parents. The staff were fantastic and the support we received from other parents on the unit was amazing. We have met some fantastic families, who have shared our highs and our lows and supported each other through some rough times. We definitely made friends for life. Hollie’s doing really well now and is turning into a proper little lady. We still meet up with our friends and are very involved in the parent support on the unit. I knew Harrison was going to be born early and poorly after my 8 week blood results came back, I am rhesus negative but also carried the Anti D anti bodies, this meant weekly bloods and Doppler scans to make sure my antibodies were not attacking my boy. We managed to get to 28 weeks and my levels became very high indicating Harrison had become dangerously anaemic. He had his first blood transfusion when I was 29 weeks pregnant still in utero. They said that should hold him for 3 weeks then they would decide on inducing me early or giving him another transfusion. On the Monday, my family and I went to Wales for a holiday. By the Wednesday Harrison had stopped moving so we went to hospital in Wales to get checked. They wanted to deliver him there but my gut said no. I came home the next morning and went straight to Oldham. On Thursday 14 May, my boy was delivered via emergency section, 2 months early. I was mortified, this was at 5pm and by 10pm, I still hadn’t met my boy. The doctor told us to expect the worse and that our boy probably wouldn’t make the night. They had started his blood transfusion and we had to just wait and see. At 9am the next morning I finally got to meet my prince and he was still going strong, trying his best to stay alive. He had been through so much I just wanted to pick him up but I couldn’t. He was on the Billi bed and there were so many lights, he had tubes coming out of everywhere and a machine to help him breath. He had many problems including a bleed on his brain, a hole in his heart and so much more. After 12 long days, I finally got to hold my boy. It was such a special moment I was told Harrison was getting stronger but we still had a way to go. We were in NICU for 9 weeks and 5 days, the staff was amazing they did everything for Harrison. Isabella was born 9 weeks early in November 2010, weighing 3lb 5oz. I’d had a straight forward pregnancy up to that point but that morning I hadn’t felt her moving much and had a few twinges. I was monitored at antenatal clinic and everything showed both me and the baby were fine. Two hours later I was suddenly in agony and thought something was seriously wrong. It didn’t occur to me that I could be in labour, yet half an hour later we were in the delivery suite being told I was 9 1/2 cm dilated. Isabella was born not long after. Once she was born I was able to have a quick peep at her before she was whisked away to the neonatal unit. She was struggling to breathe so was put on c-pap to help her. I was able to go down to see her after a couple of hours but it was 3 days before I was allowed to hold her. She looked so tiny and fragile in the incubator with so many wires and tubes we could barely see her. For the first couple of weeks I just felt numb, like this was happening to someone else not us. It had all happened so quickly and I was in shock. I didn’t feel like I’d had a baby and didn’t feel like a real mum. Isabella had her ups and downs, she was on c-pap for 5 days, had prolonged jaundice and had a bleed on her brain. The neonatal unit quickly became our second home and as we became more involved in her care (changing nappies, tube feeding etc) I began to feel more like her mum. We were finally able to take our girl home after 4 long weeks, weighing just 4lb 6oz. I don’t think what happened really hit me until after we had come home and I felt quite isolated and ‘different’ to other new mums. Isabella had severe reflux, struggled to put on weight for a long time, and seemed to have a permanent chest infection for the first 2 years, she also had a few developmental delays. She had follow up brain scans and appointments with her consultant until she was 2 years old. Isabella has just had her 6th birthday and is doing so well. She has no health concerns now and has had a massive growth spurt in the last 12 months, bringing her to average height for her age. She has come so far and I couldn’t be prouder of her. Robbie was born at St Mary’s hospital, at 23+2 days on the 28th April 2016, he weighed 1lb 5oz. 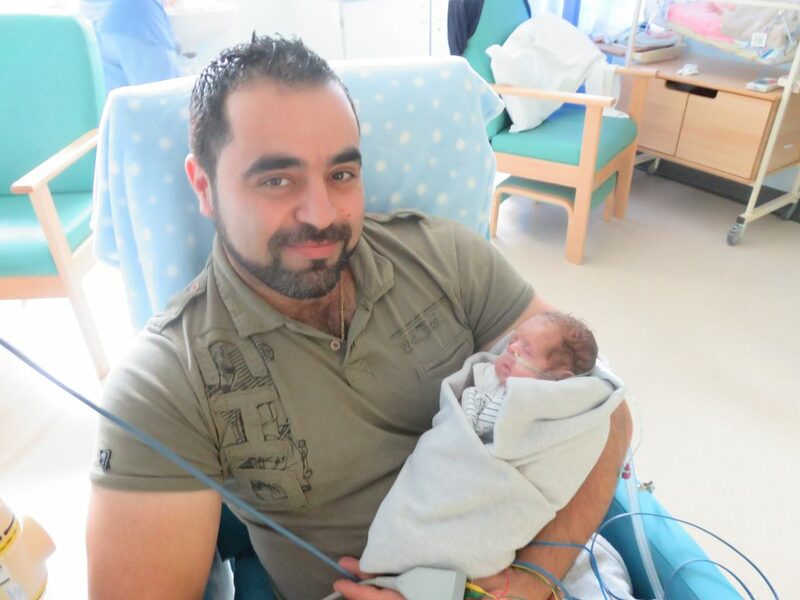 He was taken to the NICU straight away and put on a ventilator within six minutes of being born. This was the beginning of an unforgettable 10 month journey. Every week there would be a different priority. First it was reducing the ventilator settings which took two months to eventually get him off after three courses of steroids, then it switched to his eyes or heart then back to lungs. Infections, immunisations, blood transfusions. All these things were a setback. Having a child in NICU is like being on a permanent rollercoaster of emotions – you can take one step forward and then three steps back. Things you expect to do naturally with a baby become big milestones for you, every ml of milk and every gram gained was a step in the right direction. Bonding with Robbie was a milestone in itself – I was too scared to form a bond in case I had to say goodbye. I was in shock and found it so hard to even talk to him. Most parents cuddle their child in the first few minutes after they are born – I had to wait two weeks before I could give my son his first cuddle. Robbie’s eyes were fused shut when he was born. It was nearly three weeks before he opened his eyes and could see me, but I can’t put into words how rewarding and exciting each of these little milestones felt to us. The first hours and days are crucial. You do your best to rest and you begin to build trust in the people who are caring for your child. These days merge into one, you live in a constant bubble and it’s almost as if you feel safe. Nothing that happens in the outside world matters anymore. It became a bit like a job I would be on the unit for 9am caring for Robbie, dressing him and bathing him, play time with him, toys, stories or music including physio. I made friends with the nurses and other parents, so would chat to them all the time. I would nip out for some lunch and then be back with Robbie till dad arrived back from his work at 6pm. We would spend time together as family and then Dad and I would head to the pub or go back to Ronald Mcdonald and watch a film – this was our new life but we always knew it wouldn’t be forever. After 245 days on NICU, Robbie left Saint Mary’s and was moved next door to Ward 85 at Royal Manchester Children’s Hospital. Here we got even more confident and prepped for taking him home. But as usual there was still ups and downs. After 307 days Robbie was finally discharged on the 28th February 2017. He came home on oxygen but every month we have been able to wean him and as we wait for an operation to fit a gastrostomy he is fed by a tube but we are making slow progress weaning him into solids. The hole in his heart has closed, the bleed on his brain has gone and he wears glasses now. Who knows what other challenges he will face as he gets older but we know we will always have great support from the hospital. finally home together as a family. At 21+2 weeks into my pregnancy, I had Pprom (preterm premature rupture of membranes) – in other words my waters broke. I was told by many doctors that I would go into labour imminently and that my baby would not be resuscitated as he was not yet viable. After a week in hospital with no signs of labour, I was sent home on bed rest. I leaked amniotic fluid constantly. My son seemed to be growing well at scans but he never had more than 0.8cm of amniotic fluid around him (average is 12-20cm). Apart from going to the Trauma Unit at the hospital for checks twice a week, I lay in bed for 9 weeks. Labour came quickly. My son was breech and doctors prepared me for a section. however, it was too late, he was coming fast. A few big pushes later and my son Tommy came into the world. I had prepared myself for the worst. The most important time for lung development is between 19-24 weeks gestation and the amniotic fluid is vital to help the lungs mature. Although Tommy was born at 30+5 weeks, there was a very high chance his lungs could have been the size of a 21 week old foetus, and therefore not able to support his body. As Tommy was born, he let out a tiny cry. To me it sounded like a roar. Our boy had arrived. The next 48 hours were very scary. Unfortunately, Tommy’s lungs were causing concern and both collapsed. He needed two chest drains to remove fluid off his lungs and was ventilated. He was on an oscillator which made him vibrate to promote the vessels in his lungs to open more. Finally, he was on the highest dose of nitric oxide to treat pulmonary hypertension. Tommy was gradually weaned off everything as he grew stronger. He was left needing CPAP for 6 weeks until he started on low flow oxygen. The rest of his NICU stay was uneventful. Tommy needed to learn how to feed and to grow. Eventually after 54 days of NICU we found ourselves having oxygen installed in our house, rooming in at the hospital and preparing for our son to come home so we could be a proper family. My advice to new parents on the unit is look after yourself emotionally and mentally. Take time out, even just a few minutes, to check in with reality and be normal again. Tommy is now three years old. He is no longer the special care baby he once was. He is funny, clever, naughty and brilliant. He has no lasting health effects from the Pprom or his time in NICU.